I USE GOOGLE HANGOUTS and chances are you don't. The technology exposes personal constraints. Most people I know don't want a video element in their collaborations. In fact, because of a video camera used during intra-campus meetings that I attend, some people give the meeting a miss. Or they sit obliquely to the camera's viewing range to ensure no face time in the meeting. Personally, I don't mind those videoconferences because they save money. And because there's often a meeting set to start close to the running time of the videoconference, the video-assisted meetings hold closer to their agendas. It's worthwhile having a look inside how Google is nudging video conferencing towards a mobile experience. I've hung out in three handheld video conferences during the month of May 2012 by using my iPod Touch and a 3G O2 Hotshot in Ireland. These have been easy and seamless. They require less overhead than any other kind of virtual collaboration I've used. They also require an awareness of light, noise, camera angles, back channels and running notes. If you're a road warrior who needs to hook up with home office, your family, potential clients or casual friends, I recommend buying a smartphone that has a front-facing camera. You need that capability to use Google Hangouts in your pocket. Actually, I recommend buying an iPod Touch because its implementation of Google Plus is as good as Steve Jobs would've specified. If you're always caught in a bad hair day or if your connectivity is choppy, you can kill your video and just hang out with an audio feed from yourself while watching and listening to others. Bernie Goldbach in Cashel | Info reblogged from Ideas in Food. I LOVE GETTING FOOD delivered via my Typepad Dashboard. Today's savoury suggestion came from Ideas In Food. They "took a beef flap steak and cooked it sous vide with butter for 24 hours at 55C ... then we cooled it down and portioned it into smaller pieces, which were sauteed in butter. Once the outside was nicely browned all over." I'm sold. I have to get the cut from our local butcher and also find a recipe for fish pepper-yuzu hot sauce. Our four-year-old food critic will enjoy the sauteed broccoli rabe dressed in flavored brown butter. I don't know if she'll go for the "touch of coconut cream cheese seasoned lightly with fish sauce" but we'll try it and report on the results. Reblogged from blog.ideasinfood.com and saved as a food link. I'VE A "SAVED SEARCH" for Kindle in several online tracking systems because I believe that platform's use is growing faster than Twitter. It's certainly growing revenue faster than many social networks and points to job prospects for our third level students in the Limerick Institute of Technology. I'm interested in Kindle because I teach an e-publishing module in LIT--possibly the only third level e-publishing module in Ireland assessed totally through the completion of Kindle, iBook and PDF documents. The module surveys the challenge of becoming a published author through traditional channels and lays out a process for publishing to both the Kindle platform and the Apple Book Store. Both can result in real money alongside mainstream acclamation. What's remarkable for me is considering that by teaching this module, we are actually helping students create their own jobs. The curriculum itself is part of a self-published success story along with a story about the evolution of local newspapers that deserves to be acclaimed in the mainstream press this year. OUT ADVENTUROUS FOUR-YEAR-OLD wants to be kitted out for Summer 2012 so she can use the jungle gym outside regardless of monsoon conditions. She wants the Puddleducks “Rain or Shine” Offer. So we're giving her one more cooling-off day before buying an Eco Dungaree and Jacket Set for €24.99. We get that price break when ordering at the same time as a Kid's Wetsuit. That saves us enough to go to the Monkey Maze three times. LIKE MANY PEOPLE on the streets of Dublin, I often use Google to check things like quiet coffee shops with free wifi. Today, I've spotted contacts of mine in the search results giving upvotes to different venues. When I walk into many of my favourite haunts, I see front window space given over to "Find Us on Facebook" or "Check in with Foursquare". Both of those services charge less than half of what Google charges for an advertisement. Yet on my mobile phone, I get faster and often more comprehensive results with a straightforward Google search. Things are a little different when using either the Google Plus or the Google Places app. 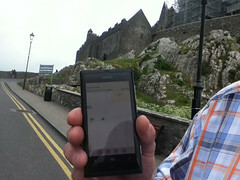 Bernie Goldbach in Cashel | Image of the Lumia showing a cache. I CONSIDER GEOCACHING part game and part trekking. While helping our four-year-old daughter navigate towards several discoveries, I've gathered some ideas worth sharing for other geocaching newbies. We start our outdoor geocaching adventures indoors by talking to our mountaineering pre-schooler about the kind of shoes she should wear for the cache we're about to locate. I use a Nokia Lumia phone to select favourites and we normally talk about what the clues mean. I've discovered we can increase the spatial awareness in young Mia by discussing words like "along" and "under" and "behind." It helps that she has developed her perceptual awareness of these prepositions because it makes field guidance easier when we're within 300 metres of the cache. It's essential to review the cache attributes since these icons always help narrow choices of geocaches. We're staying at or below level three in difficulty with young children leading the way. I LEFT 3D CAMP in Limerick with tingling sensations arising from holding tactile data served by Trevor Hogan. 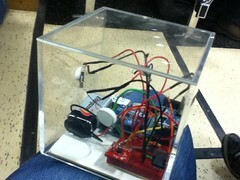 The see-through box on my knee (at left) vibrated when it received data sets from research done by Trevor Hogan at the Cork Institute of Technology. Hogan has conducted several different studies that display results in a tactile manner. One study explored people’s affective responses when experiencing data represented through different modalities. He could have sampled his audience in the University of Limerick for deeper analysis. Most researchers present results on screen in the form of graphs or charts. When results come in your hand or on your knee as vibrations or as light patterns, they may elicit deeper responses. The tactile technologies are "data-driven artifacts (DataBox and SonicData) that represent the same dataset" as an area graph or pie chart. The phenomenological approach to tactile data display, using the Repertory Grid Technique (RGT) during a group session to elicit participant’s personal constructs, received passing mention during Hogan's 3D Camp presentation. He passed around a data dowser and the Arduino-powered box in the photo which presented data in a manner I had never experienced. But then I realised I had been there before. I PRESS A TRIP odometer when I fill up the tank of our car and when the 90 euro fill-up becomes fumes, we still have a minimum of 28 miles to complete the week. We don't have the discretionary income to add more fuel so we have to cut back on family trips to cousins several counties away. It has to be a funeral, christening, or wedding to turn the wheels nowadays. Festivals, day trips, garden shows are parked in our memories. I haven't done an econometric analysis on the prime determinants of fuel costs but I know the Irish government fondly calls its excise duty on fuel one of its "old reliables" so I can assert that we are helping pay down Irish debt whenever we refuel and when we pay annual road tax. So we are sitting on our empty wallets home along with dozens of other households living through fuel anxiety in austere Ireland today. It doesn't feel very patriotic watching the needle drop to to empty. 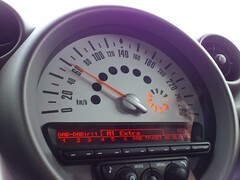 It happens a lot as we drive around with a little yellow light illuminating the petrol gauge. Bernie Goldbach curates links about Ireland and will write an ebook on what it means to be an American in Ireland. MY LIFE GOES SMOOTHER with chunking. And elegant chunking helps produce compelling multimedia. This is a topic that will evolve in greater detail throughout the summer, then will appear in several places in our creative multimedia degree as part of a production process. Chunking starts with a scribbled thought in my Moleskine notebook. Those who read me regularly know those written notes become Evernotes. Some germinate as blog posts, video clips, audio moments or content that sits inside Kindles or iBooks. Chunking will feature as a key term during my afternoon presentation at the 2012 e-learning summer school (#elss12) in the Dublin Institute of Technology. And chunking helps keep my focus on the real world, the one crawling at my feet at home. 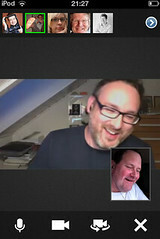 Bernie Goldbach curates links about GTD. I GOT MY WIFE a Motorola Xoom Media Tablet for her birthday and swore I would not be spotted using it. But I'm allowed to share first impressions. It's a lot lighter than the first generation iPad and it feels lighter than the iPad 2 I've used. It runs smoothly with its 1.2GHz CPU and Android 3.2.but its lack of an SD card surprised me. That said, its built-in MotoCast streaming capability looks like it will work a charm if I can serve the Xoom proper wifi broadband. I will cast the video and audio clips from the cloud, not from a local laptop because I can't get reliable one megabit per second upstreaming. I couldn't push the Xoom's screen to as bright a level that I can achieve with the iPad. 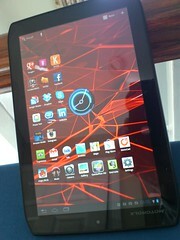 However, its colours and viewing angles are better than the iPad. And it snaps through apps smoothly. During the summer, we'll have more to say about the screen's performance while out in the wild exploring geocaches. We'll see how the back seat kids like using the Xoom's built-in Flash and whether they prefer it to the iPad's YouTube app. Most importantly, we will ruthlessly put its splashproofing through the wringer. Bernie Goldbach curates links about Android.